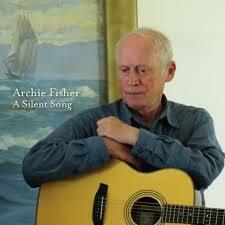 I should confess right up front that Archie Fisher is one of my very favorite song writers and performers. It isn’t overstating the case to say Fisher (along with Jean Redpath and NPR’s Fiona Ritchie and Thistle and Shamrock ) had a lot to do with my interests in the Child ballads, Scots, Middle Scots, and ultimately, medieval literature. A Silent Song is Fisher’s latest album, one of at least a dozen I can name. For those of you who don’t know who Archie Fisher is, he was producing albums, playing guitar, and performing with people like Bert Jansch and Tommy Makem and producing for groups like Silly Wizard for the last thirty years or so. He has at least six previous solo albums. Fisher comes from a family of musicians, including a Scottish Gaelic speaking mother, and two sisters (Rae and Cilla Fisher) with albums of their own, not to mention a joint album featuring the Fisher family. He’s toured with Bert Jansch, John Renbourn and Garnet Rogers. His songs have been covered by all sorts of people, including Tommy Makem and Garnet Rogers. His most famous song is probably “The Witch of the West-Mer-Lands,” a song which for years I thought was a traditional ballad that Child just missed, because Child did miss some. But no, “Witch of the West-mer-lands” is Archie Fisher’s own (“The Final Trawl” is his too). Fisher worked on several documentaries for BBC Radio Scotland and from 1983–2010 was the host for the folk and traditional music program Travelling Folk . That, in turn led to Fisher directing the Edinburgh Folk Festival from 1988–1992. Those achievements led in part to Archie Fisher being awarded an MBE by Queen Elizabeth II in 2006. This is the song that will stick with me the most; it made me sit up when I first heard it on YouTube, and again when I first played the CD of A Silent Song . the Red House Records website features videos of the tracks on the album as well as audio samples. You’ll also see the dates for Archie Fisher’s current concert tour, starting on 9/18/2015 in Minneapolis, and ranging through New England and Pennsylvania. Some of the shows feature Garnet Rogers along with Archie Fishers. I’ve seen them both in concert; if you possibly can, you should too.